"On any clear cold weekend in October, tens of thousands of men, women and youngsters gaze skyward from the rocky ridges across the land, and from strategic spots along the coast and the Great Lakes. All stare fixedly at black spots in the blue sky; many use expensive binoculars. They are not plane spotters; they are hawk watchers, devotees of an increasingly popular facet of the sport of birding..." (Roger Tory Peterson, Editors note, A Field Guide to Hawks, William S. Clark & Brian K. Wheeler). Roger Tory Peterson published the his first field guide in 1934, the same year Hawk Mountain Sanctuary was created. At the time, RTP only knew of three good places to watch raptor migration: Hawk Mountain, PA, Cape May, NJ & Point Pelee, Ontario. Now there are 100s of "Hawk Watch" sites around the world visited daily by 1000s of people during the peak raptor migration periods. Many migration sites have official counters that document the numbers of each species that are seen. These data are being used to monitor raptor populations world-wide. Roger Tory Peterson should have included September because the peak numbers of raptors can be seen at many sites around September 21 (First Day of Autumn). Depending upon the species and location, Autumn/Fall migration starts in August and can last into December. There is also a Spring Migration of raptors as they return from Wintering areas to their breeding areas. The Spring Migration is shorter duration, with most birds being seen during March, April and May. We have compiled a list of sites where raptor migration can be observed. The list includes many of the key migration spots throughout the U.S., Canada and Mexico. We've also added sites we know of personally. This is a good place for beginners to start to find local hawk watch sites. The links below are not active, simply copy the links and paste into your browser. Alabama - Fort Morgan/Gulf Shores - Gulf/Caribbean Flyway - Best time to see migration is in the Fall - A historic site in 1970s for Peregrines, but no current information or contacts. A good site for Harlan's Hawks. Thousands of Golden Eagles seen here. a good site to see Osprey. great place to see migrationg Peregrine Falcons see video below. Watch as counters see 1,506 Peregrine Falcons on one day (Oct. 25,2015). Georgia - Little information except for some migration noted near Atlanta. The Coast must also have raptor migration in the Fall. 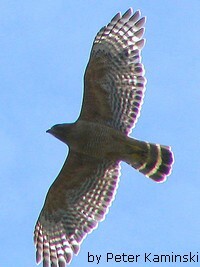 Hawaii - No regular Raptor Migration. averages 13,000 raptors each Fall. Kentucky - Little information except for some migration noted at Pine Mountain in the Bad Branch State Nature Preserve and in the Cumberland Mountains (Cumberland Gap National Historic Park) - Central Flyway - Best time to see migration is in the Fall. This video by Hawk Watch International explains why they collect raptor migration data. This video by the New Mexico Game and Fish explains how raptor migration data is collected and used. Short video with no explaination, but the number of raptors in the video is amazing. Are Raptors Migrants or Nomads? Migration is defined as the regular movement of all or part of a population from breeding areas to non-breeding or Wintering areas. Nomadism is an irregular movement of some part of a population in almost any direction. Migration is more typical of grassland species (temperate, subtropical or tropical regions), but migration is not typical from tropical rain forests (stable & warm). Nomadism is more typical of arid and semi-arid areas in the tropics or sub-tropics. Nomadism appears to be a response to low food supply. Migration also appears to be an attempt to escape cold weather (and shrinking food supply) in temperate areas, but this is not always true of migrants in tropical areas. Winged Migration Video Witness as five film crews follow a rich variety of bird migrations through 40 countries and each of the seven continents.